Recent Upsurge in Shia Target Killing Claims 5 More Shia Hazaras Lives in Quetta ,Pakistan . JNN 07 June 2015 QUETTA: Terrorists Allied to Banned Outfit Sipah e Sahaba Pakistan Martyred five people belonging to the Shia Hazara community in Quetta’s Bacha Khan Chowk area on Sunday evening, Media reported. Police sources said terrorists opened fire at two shops near Bacha Khan Chowk, the city’s commercial hub. Police stated the deceased belonged to the Shia Hazara community. Four people had died on the spot while there was one injured who was rushed to Combined Military Hospital (CMH) Quetta for medical treatment. However, he later succumbed to his injuries. The Martyred have been identified as Mohammad Ali, Mohammad Idrees, Kazim, Zeeshan and Nematullah. Police said the terrorists managed to escape from the scene. It was an act of Sectarian targeted killing, police sources told Dawn.com. Soon after the incident, markets and business establishments were closed and panic gripped the area. Traffic vanished from the roads. Police and personnel of Frontier Corps (FC) were called to the area to bring the situation under control. Balochistan Chief Minister Dr. Malik Baloch strongly condemned the incident and directed the police to bring the perpetrators to justice. “Strict action will be taken against the elements involved in the target killing,” he said. The chief minister expressed sympathy with the bereaved families and promised all possible help to them. The Members of the Shia Community and the family members of the martyrs took the Dead Bodies of their beloved to the Main Road and Protested , and demanded for a Quick apprehension of the Criminals , and the staged a Protest Sit In , but after successful Negotiations with the authorities , they ended up the Protest and took the Dead Bodies to the Imambargah for their funeral and Burial . 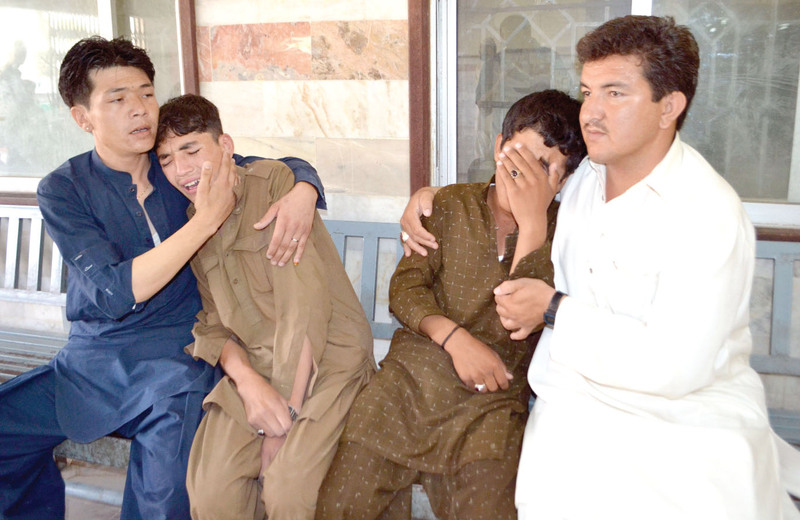 In the past few days, more than half-a-dozen Hazara community Members were also gunned down in Quetta. All the Shia Parties and Notables have shown their serious reservations on the Recent Upsurge in the Shia Target Killing , which was quite controlled after the Launch of “ Operation Zarb e Azb” . Allama Abbas Kumaili of Jafria Alliance Pakistan ( JAP ) Deeply condemned the Upsurge in the Shia Target Killing and also Blamed the Federal as well as the Provincial Governments , who have shown their Incompetence in combating terrorism , and at the same time not fully supporting the Operation Zarb e Azb in real Letter and Spirit , Due to their Personal affiliations with the terrorist Organisations . Majlis e Wahdat e Muslimeen have called for a shutter down strike , in the Quetta City and a five days mourning to condemn the Brutal event. On 28th May 2015 Two people belonging to the Shia Hazara community were Martyred when They were sitting in their cloth shop in a shopping plaza in MeCongi road area. Another person was injured in the attack.The Martyred were Identified as Arif and Haji Hussain , while the Injured was Identified as Mohd Essa. Balochistan has been experiencing incident violence and targeted killings since more than a decade. The largest province of the country by area, is home to a low-level insurgency by ethnic Baloch separatists. Al Qaeda-linked militants also operate in the region. The province shares borders with Afghanistan and Iran. The Bold and Wise Decision of the Pakistani Army to conduct across the Board Operation against the terrorist Organisations working against the Interest of Pakistan and Islam has acclaimed Major successes , But as the Nation has been Infested with the terrorism for the Last 35 years , the cleansing of terrorism and terrorist Networks is not a easy Job , and above all when the People Governing the Country , whether it is PML – N at the Center , and PPP and MQM , JI and JUI S & F both at the Provincial Levels are the sponsors of terrorism . In the Last 35 years the terrorist and terrorism has changed Multiple sponsors , as Now Not Only Saudis , UAE , CIA and MI6 are the sponsors of terrorism , but RAW and Mossad’s foot Prints are clearly visible in the country , as this is due to fact that the Majority of the People in the Political Leadership as well as the Bureaucracy are not only corrupt , but are Not even Patriotic and to achieve their Personal Benefits , they have all sold the Nation into Bits and Pieces , and now the Limit has gone upto such a level , that they are Protecting the terrorists , to save their souls . But Luckily the Present Top Brass of the Army has made a commitment to wash off all the Mistakes done by their predecessors , and to truly cleanse the Nation with the menace of terrorism of all types , whether it is Plain terrorism , Political or Economical , as they have very clearly realized and even their analyst have given them figures that , Once the Nation is just cleansed with all type of terrorism , Pakistan will become One of the Biggest economy of this region . Of which Our Next Generations will be Proud off. It is now the game of wits and wills that who wins ,whether the Loyal and Patriotic Military Establishment or the Corrupt Political Bureaucratic Ruling Class who are Traders of the Loyalty & Patriotism. This entry was posted in Asia Pacific, Jafria, Pakistan News and tagged hazara, pakistan, Quetta, shia, Target Killing. Bookmark the permalink.